People often complain that certain ship hulls are overpowered. "Ishtars OP. Tengus OP. Logi OP. Drones OP. Svipuls OP. Orthrus OP." All of these pale in comparison to the effectiveness of bonused sensor damps and information links. These are, in my opinion, the single most disproportionately overpowered thing in the game in terms of price:effectiveness. A single Maulus can reduce a Scimitar's lock range from 112 km to less than 3 km. That is not a typo, and you did indeed read this correctly: a ship that is worth less than 10M isk is capable of making a T2 logi ship worth >200M isk completely useless, and those numbers are assuming that the Scimitar is receiving sensor integrity links. Unlike ECM from a Falcon or a Griffin, damps have a near-100% success rate, and they're useful against any sub-cap in virtually any situation. Damps are useful in any gang, whether it's a brawling gang, a kiting gang, a 100+ man fight over a POS or a 5-man microgang roam. Why every single gang in the game doesn't include at least 1 Celestis or Keres is beyond my comprehension. Every time I schedule an op, the gang I ask for is essentially just a Celestis gang with whatever DPS people feel like flying. I don't really care whether people are in Omen Navies, Mallers, Caracals, or Machariels; The damps are what are going to win fights for us. The strength of damps obviously hasn't escaped the notice of Alliance Tournament teams either. Both Hydra Reloaded and The Camel Empire routinely brought 3-4 bonused damp ships in their setups in the last Alliance Tournament, and the only true hard-counter to damp-heavy setups was an e-war immune Marauder with a Bastion module. I suspect that the broader Eve community doesn't fully realize just how powerful damps can be, so I will present some numbers here. I would like for this to eventually be a comprehensive guide on sensor damps in Eve. 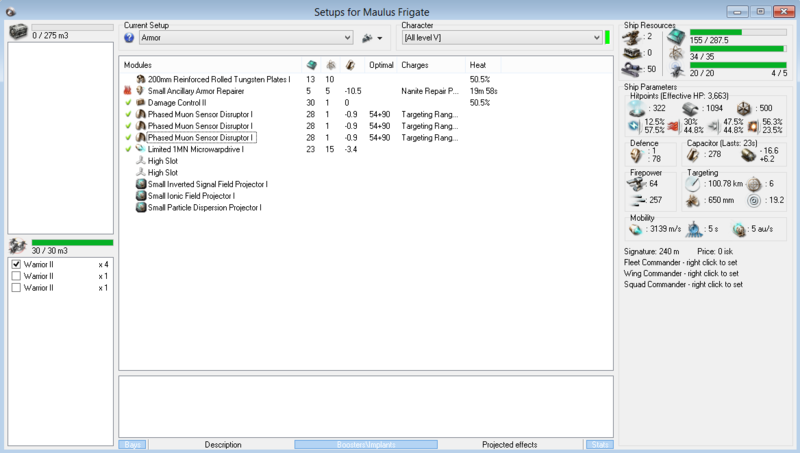 The Maulus has four mid slots while the Celestis and Keres both have 5. The Celestis is the only hull which gets a range bonus to its damps (more on this later), while the Keres also gets a bonus to warp disruptor range which gives it extra utility in small nano gangs. The Arazu and Lachesis also get the same bonus to damp effectiveness as the other ships, but they do not get an optimal range bonus. The Lachesis is pretty unique in it's ability to fit up to 6 damps, but apart from this there is not a particularly strong argument for using a Recon over a Celestis if your only concern is damp effectiveness, especially when considering the price differential. The optimal range bonus and slot layout make the Celestis an outstanding all-around damp ship in any gang, while the Keres can really shine in smaller nano gangs because of its point range bonus and added mobility. The Celestis hull is currently selling for less than 9M isk in Jita. It would still be worth using even if it cost 90M. Armor Celestis, excellent for Armor brawling gangs, and although it's a bit slow it can probably work in some armor kiting gangs too. Although it's buffer is "decent", the resist profile on the ship is not great, so you still need to focus on staying at range and not getting tackled. XLASB Shield Celestis is preferred for smaller shield nano gangs where you do not have logi support. Each pulse of the ASB restores nearly 75% of your shields, so pulse it only as needed. Edit 4/22/2015: A few new Keres fits were suggested to me. The shield Keres can drop the ACR rig if it downgrades to a meta 4 shield extender. This is also cap-stable with a standard mindflood booster. 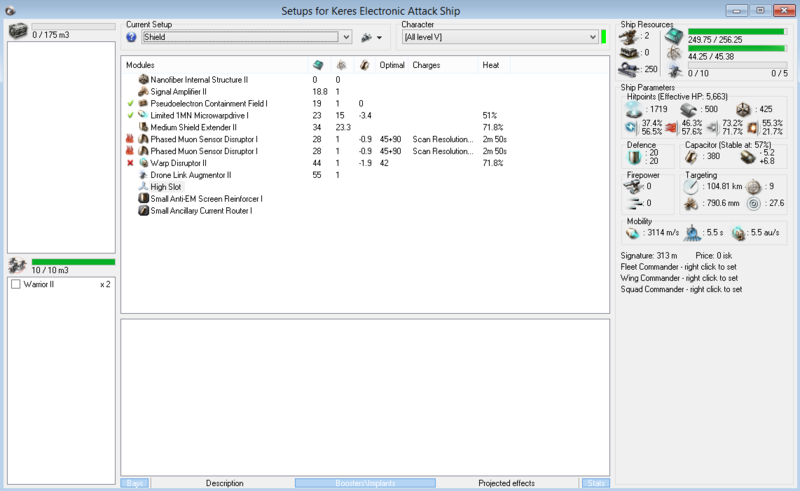 Finally, if you like flying e-war ships then you should get into Recons in order to unlock the Arazu and the Lachesis, and finally finish up Signal Suppression V to maximize the strength of your damps. Where damps start to get ridiculously overpowered is when all of these bonuses combine. A single linked, heated damp used by a pilot with maximum skills will reduce the lock range of a ship by about 84%. Usually that alone is enough. And a Celestis gets up to FOUR of them! When I first saw these numbers fairly early into my Eve career, I immediately trained Gallente Frigate and Gallente Cruiser to V and Signal Suppression to IV. I've since trained Signal Suppression V. It's worth it. A good damp pilot will know what the base lock ranges of every ship out there and how many damps are needed in order to reduce its lock range to an acceptable level. Most (non-ewar) Frigates have a base lock range of less than 60 km. Most Battleships will have a lock range of about 100 km, and Cruisers will usually be in the 60-90 km range. Logi will have lock range of about 100 km, or 150 km if they're running a sensor booster. Recons can easily hit 170-200 km lock range, even without sensor integrity links. 2. A Scimitar. Many competent gangs will be running Sensor Integrity links, and these will boost the lock range up to 112 km. 3. A Huginn. Recons have outstanding base lock range, and with sensor integrity links are able to lock up to 233 km. I'll show the lock ranges of these ships for a few different scenarios as lock-range scripted damps are applied. In every case, I'm using a Celestis with two Inverted Signal Field Projector rigs as my damp ship. The stacking penalty applies here, and any damp beyond the 4th has essentially zero impact. This already looks pretty impressive! 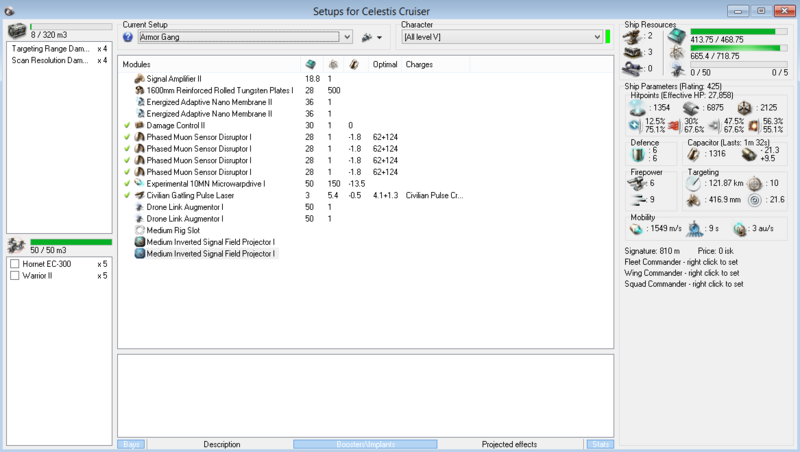 A single Celestis with three damps is able to reduce a Scimitar's lock range by nearly 85%. Shutting down a 200M isk ship is pretty good, although that alone doesn't help your small gang much if your opposition has 4+ logi ships. This is already starting to look ridiculous. With heat, now two range damps are about as effective as four unheated damps. This means that a single armor Celestis can now stop two Scimitars in most practical situations, or they can stop four Omen Navies (an ONI with a 26km lock range isn't very useful). Damps are really amazing force multipliers. People seem to complain the most about skirmish links, but information links are just as overpowered. Two damps now reduce a LINKED Scimitar's lock range to 3.5 km, which is a 97% reduction. Even a Huginn, which started with a lock range of more than 200km becomes useless with only two damps. Can you believe that the game allows this? Scan Resolution damps aren't used as often, but they're still very powerful in a brawl. If enemy logistics are balled-up on a tight anchor, then your only option can be to apply scan-resolution damps and quickly switch targets. Combining ECM with scan-resolution damps can also be very, very powerful. Time (in seconds) for a Guardian to lock another Guardian with Scan-Resolution Damps Applied. Each column shows different scenarios for the ship applying damps. Damp strength is increasing as we move from the left column to the right. The first column shows a "typical" case where the Celestis pilot has Signal Suppression IV, but is not heating his damps and is not receiving links. Next we add electronic superiority links, which for 3 damps nearly DOUBLES the lock time when compared to the case without links. Moving to the right-most column, max-strength damps with heat start to look truly ridiculous; a single Celestis now has the ability to make a Guardian take more than 60 seconds to lock up another cruiser. By that point, it will be dead even if your gang's DPS is relatively low. "LOL, whatever, I'll just apply remote sensor boosters to my logi!" 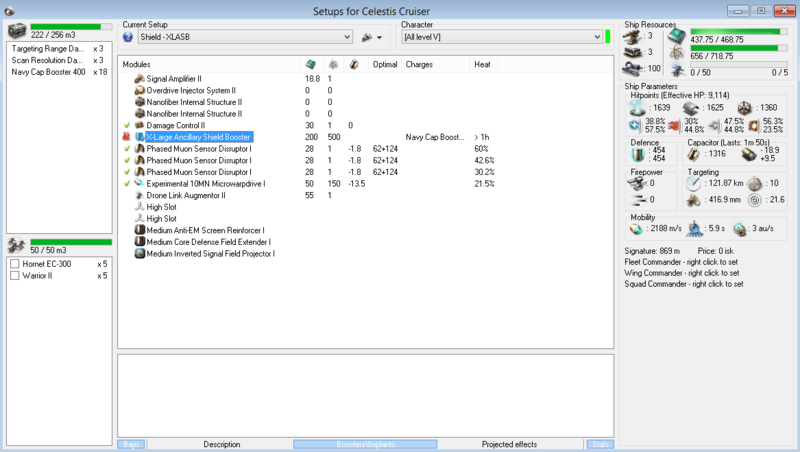 The optimal bonus of the Celestis is pretty damn strong, and I think is somewhat underrated. Having less of a % chance to miss a damp is very useful. A missed damp on an enemy Rapier at the wrong time could mean that someone in your gang gets tackled and dies. A missed damp on an opposing Guardian could mean that he locks up a target and applies reps before you can break it. Information Links (Recon Operation), although this particular link is pretty seldom used compared to the others. Flying a Celestis or a Keres well is actually pretty challenging. It requires excellent positioning on your part, as well as complete awareness of the positioning of all the opposing ships. You also need to quickly identify threats on the field and damp them, or else your entire fleet could be lost. You need to be able to do this quickly without specific instruction from the FC (he has other things to worry about, or he might give you an order which is stupid). On top of that, you need to be aware of opposing tackle frigates or anti-support ships and run away from them if necessary. It's a much tougher job than being an F1 monkey. 1. Other bonused damp ships (Maulus, Celestis, Keres, Arazu, Lachesis). Damp these ASAP. If you don't, then you need to assume that they're going to damp you. If you're flying a Celestis with less than 20 km lock range, then you're pretty useless, and all the potential force multiplication your gang can get from having damps is lost. 2. Every other e-war ship on the field, especially Recons. This could include Huginns, Curses, and Rooks, but also Griffins, Blackbirds, and sometimes even Crucifiers will need to be dealt with. 3. Enemy Logistics. This should be obvious. 4. Long-range DPS. This also should be obvious. Damping an Omen Navy or a Cerberus to less than 10 km lock range completely negates their ability to apply damage. For the most part, you should focus on damping your targets and on not getting tackled. These are your goals. If you try to use your damps to whore on killmails when there's other high-priority targets on the field that should be damped, then you're an idiot. One big advantage of a Keres is that it can pera-run its MWD in addition to 3 damps and remain cap stable. A Celestis however is not cap-stable with its damps running (only having about 2 minutes of cap life), so you must carefully pulse your MWD. If your gang has logi, then make sure you stay within logi rep range. I thought I'd share a few videos showing Sensor Damps in action. Let me know if you have a great Celestis or Keres video and I'll add to the list. Sensor damps are and exceptionally powerful and reliable form of e-war that can benefit any gang. Unlike ECM, damps will succeed nearly 100% of the time. Unlike target painters tracking disruptors, or long-range webs, they're always useful no matter what ship they're being applied against. Heat and Information links raise the strength of damps to such an absurd level that it amazes me that they haven't been nerfed yet. Take this as motivation to skill your link alts into information links and abuse this for as long as you can. Given enough time, I have to believe that everyone will recognize how strong these are, and that Celestises will become as essential to gangs as Logi currently is.